This week is the last week of my Spring Internship at the Burke Library. It has been such a great experience! I’ve received hands-on training on the entire archival experience: the initial processing, creating the finding aid, managing it in its digital form, and broadcasting it for all the world to see. In addition, I have seen the ins and outs of running an academic library, including the not-so-glamorous sides, like vermin patrol and how to Macgyver a situation where you must move 80 boxes with only a silver cart, one narrow elevator that can’t fit you AND boxes, and several mini-stairways (answer: through teamwork and running). The Burke Library has provided me a valuable internship where I was part of the team, given creative freedom, and trained from day 1 on what archiving is and why it matters. Brigette, Liz, Beth, and Matthew have been great coworkers, and I have enjoyed working with them all. However, it’s not the end! The semester is wrapping up, but I will be staying on during the summer as well, interning for credit from my graduate program at Pratt. I will be doing more archival work, but in a much different capacity. 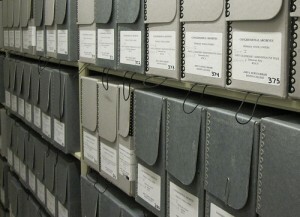 As I referenced in my last blog post, we are wrapping up a 3 year archiving project. My work this summer will be to help finish this project, updating finding aids, more DAM and EAD training, and contributing to evaluation summaries as well. I will also be doing more work with Burke Director Beth Bidlack, learning more about what goes into running a library. Finally, I am attending the American Theological Library Association Annual Conference next month, to see how theological and academic libraries are run across the country, and learn best practices across a wide array of topics. I’m looking forward to continuing my work at Burke, and know that I will continue to gain valuable skills and connections. Thanks for reading this semester, and I’ll see you in the summer! This entry was posted in Student Entry and tagged Archives, Burke Library, CUL Graduate Student Internship, interns, students on May 6, 2014 by Sarah Davis.